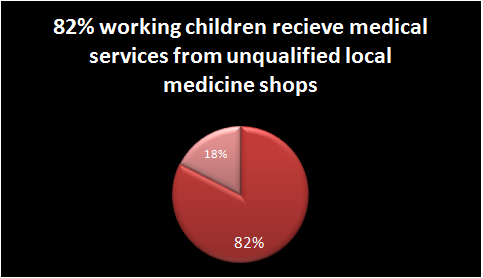 A recent study of UKBET in partnership with Social work department –Shah Jalal University of Science and Technology says that 82% of the working children take medical treatment of their illness from unqualified local medicine shops. UKBET has arranged basic medical serices fovr the working children of its project area. Now these children can get free medical services from nearby private hospital or from the weekly medical camp at UKBET CENTER FOR WORKING CHILDREN at Noyagaon and Uposhohor point Sylhet.